We were productive again today! Dan put up the new shade and two sets blinds as well as worked on installing our fireplace screen and I processed about ten pounds of peaches! I did another batch of preserves as well as some sliced peaches. I'm not 100% sure the sliced peaches will work out, though, as apparently enough water boiled off (& splashed out because my pot was too small but the big pot just won't freaking boil) during the water bath that the very tops of the cans weren't covered by the end. Boo. It looks like all of the lids have popped though, so maybe they are going to be okay? 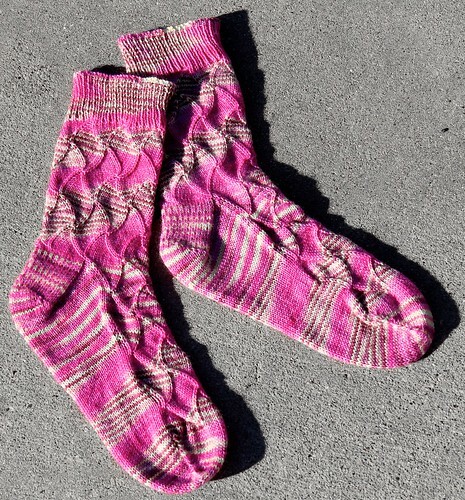 In still productive but less edible news, I have officially finished my latest pair of socks! The weather has cooled a tad so it took a long time for them to block (three days!) but they are all done and happy now. They are a little difficult to get over my heel (apparently I have thick ankles) but with a little wiggle they go on and fit great, so I'm pleased with them. I will, however, have to make a mental note to go up a needle size on sock patterns that aren't stretchy (like lace or ribbing) so they go on easier. It's only taken me two pair of hard-to-slip-on socks to figure that out! Where is My Celebratory Marching Band?